A green and red Perseid meteor streaks across the sky just below the Milky Way in August 2007. The galactic center in the direction of Sagittarius. The primary stars of Sagittarius are indicated in red. 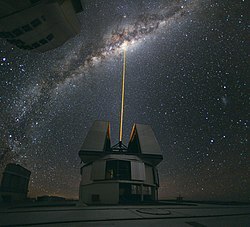 "Laser towards the Milky Way". Despite the first impression of a science-fiction movie, this extraordinary image is of recent cutting-edge research. It was taken at the high-altitude Paranal Observatory in Chile. The laser reaches 90 km into the Earth's mesosphere to form a reference point. It helps sharper observations of phenomena such as the giant black hole at the centre of the galaxy. આકાશગંગા (અંગ્રેજી ભાષા:Milky Way) એટલે આકાશમાં દેખાતી ગંગા. સ્વચ્છ હવામાન હોય ત્યારે રાત્રીના સમય દરમિયાન આકાશમાં જોતાં દુધિયા રંગનો એક ઝાંખો પટ્ટો જોવા મળે છે, જેને આકાશગંગા કહેવામાં આવે છે. આ એક તારાપુંજ છે જેમાં પૃથ્વી સહિત આખા સૂર્યમંડળનો પણ સમાવેશ થાય છે. આકાશગંગામાં ૧ અબજ કરતાં પણ વધુ તારાઓ આવેલા છે..
વિકિમીડિયા કૉમન્સ પર category:Milky Way વિષયક વધુ દ્રશ્ય-શ્રાવ્ય માધ્યમો (Media) ઉપલબ્ધ છે. ↑ "The Milky Way Galaxy". seds.org. Archived from the original on 20 April 1999. Retrieved 5 August 2010. ↑ "The Milky Way Galaxy". cass.ucsd.edu. Retrieved 5 August 2010. ↑ "NASA - Galaxy". nasa.gov. Retrieved 5 August 2010. ↑ "01.09.2006 - Milky Way Galaxy is warped and vibrating like a drum". berkeley.edu. Retrieved 5 August 2010. ↑ "Milky Way, Discover of Milky Way, Milky Way Galaxy at SPACE.com". space.com. Retrieved 5 August 2010. આ પાનાંમાં છેલ્લો ફેરફાર ૧૪ ઓગસ્ટ ૨૦૧૪ના રોજ ૦૪:૨૧ વાગ્યે થયો.